The Mens Keb Trousers from Fjallraven are a pair of hardwearing and durable G-1000 walking trousers. They are made from Fjallraven’s G-1000 material making them extremely durable meaning that you can wear them on the toughest treks and walks with peace of mind they will tackle any challenge facing them. Not only is G-1000 a durable and hardwearing material but can also be adjusted regarding how water resistant they are. You can make the trousers more or less weather resistant by applying Fjallraven Greenland Wax. This makes these walking trousers extremely versatile wherever you may be exploring. Simply apply more wax for a wet and windy day and less if it’s a sunny day but you still want to wear a pair of durable and sturdy walking trousers for your hike. 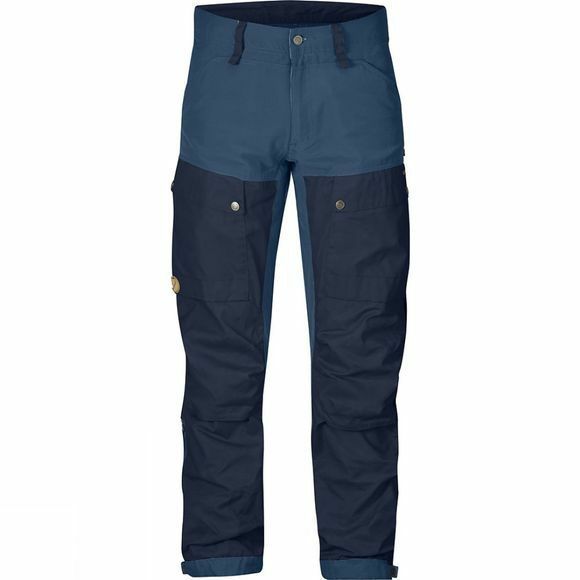 Not only are these outdoor trousers hardwearing but also have all the features you may require such as reinforcements in high wear areas such as the Knees and Seat along with pockets that are suitable for knee pads if they are being used as work trousers. Explore our wide range of walking trousers for your next outdoor adventure.